David Ortiz is about to "get hotter than Jamaica"
David Ortiz was 0-5 on Sunday, and just 1-13 in the three-game series against the Kansas City Royals. Those aren't good numbers. But if you look closer, they aren't as bad as they look. While Ortiz was 0-5 Sunday, he didn't strike out. He grounded out all five at bats. Also, during the whole series he didn't strike out once. He made contact in all 13 at-bats, with two hard hit balls. One for a double and one for a deep fly-out to center. Making contact in 13 straight at-bats is pretty impressive, with no walks or strikeouts. So, when you see he was 0-5 Sunday and 1-13 in the series you'd think "Great, just what we need while the team starts to turn it around. Ortiz to get cold." But the fact he made contact every time shows his timing is just a little off. David has been to the all star break 9 times out of 10 between 2004-2013. 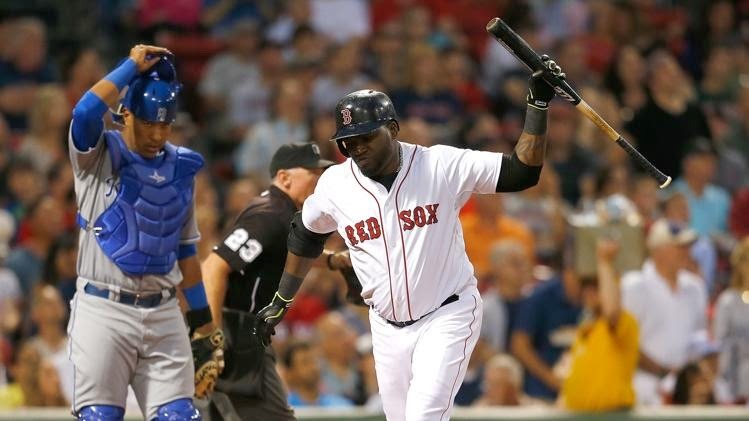 “I feel like that All-Star break, having those four days didn’t help me,” said Ortiz. “Physically they helped me, but timing-wise, I feel a little off. It makes sense if your used to only 2 or 3 days off in the middle of the season for 9 years, compared to 6 or 7 days off, that'd throw a lot of people off. But as the title says, Big Papi is confident he'll "get hotter than Jamaica in the middle of August." Good thing to hear. As I've said before, a hot Holt (4-13), Pedroia(1-12), Ortiz(1-13), Bogaerts(1-6), possibly Napoli(4-7) and Victorino(3-7) with timely hits by JBJ (3-8)and Nava(3-7) (5 for 8 with runners at third with one out) this team can make a hell of a comeback. Here's to hoping the whole team joins Papi in getting hotter than Jamaica.